Various sources suggest that about two hundred billion stars make up our galaxy, stretching over some 100,000 light years or about 30 kiloparsecs in a flattened disk which is about 10,000 light years ( 3 kpc) thick at the center. The sun is some 8.5 kiloparsecs out from the galactic center. About 6000 stars are visible with the naked eye. We can investigate the structure of our galaxy in various ways, but can't get outside of it to see what it looks like. 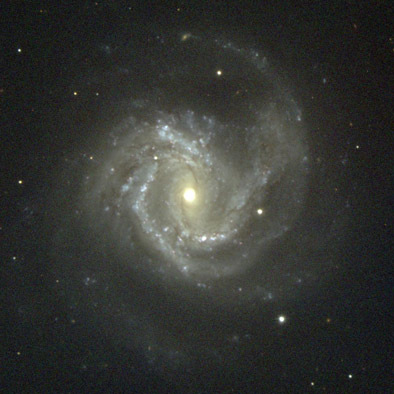 Spiral arms have been detected, and it seems to have a structure similar to the image of galaxy M61 shown. Recent studies indicate that there may be more of a central bar than M61 shows. The Milky Way in infrared. This is a photo toward the center of our galaxy taken by the COBE satellite in the infrared. In infrared you can see through some of the dust surrounding the galactic center and show the flattened shape of the galaxy with its central bulge. How many stars are in the Milky Way? Estimates are around 300 billion or 3 x 1011, perhaps plus or minus a 100 billion. Estimates are obtained by obtaining a measure of mass by analyzing rotation times and subtracting dark matter, then obtaining an average star mass. 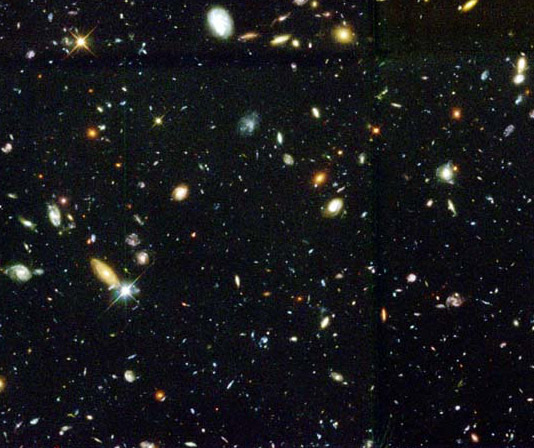 Uniform projections from the Hubble Ultra Deep Field lead to an estimate of 100 billion (1011) galaxies in the universe. At right is an attempt to give a perspective of the Sun's location in the galaxy. It is based roughly on a sketch by Gonzalez and Richards. It shows the Sun as located between the Perseus and Sagittarius arms of the Milky Way. Gonzalez and Richards comment that this is one of the best locations in the galaxy for learning about stars, galactic structure and cosmology. 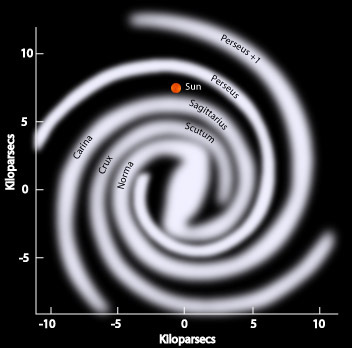 There is considerable variation in the naming and visualization of the the spiral arms, so the details here should not be taken too seriously. Two small irregular galaxies called the "Magellanic Clouds" are relatively near the Milky Way. The Large Magellanic Cloud is at about 160,000 light years and the Small Magellanic Cloud is at about 200,000 light years from us. The Andromeda galaxy is the nearest large galaxy at about 900 kiloparsecs or 2.9 million light years. Within our galaxy are some star clusters that may visually resemble galaxies because they form distinctly visible groups in a relatively small region of space. They may be open clusters such as the Pleiades or globular clusters such as M30. COBE image discussion on NASA WMAP site. M61, National Optical Astronomy Observatory posting. There are many geometries of galaxies including the spiral galaxy characteristic of our own Milky Way. The above image is a segment of the remarkable deep field photograph made by the Hubble Space Telescope, every visible object except for the one obvious foreground star seems to be another galaxy. An even deeper view was obtained in the Hubble Ultra Deep Field in 2003-04. The Extreme Deep Field dated 2012 added greater resolution. Elliptical galaxies usually have very little gas or dust and hence little evidence of new star formation. The spiral galaxies may have an abundance of gas and dust and show evidence of star formation in the form of lots of hot blue stars. The key to classifying a galaxy as a Seyfert Galaxy is the presence of broad emission lines from the bright, star-like nucleus. They are often strong radio and infrared sources. The first such active galaxies were discovered in 1943 by Carl Seyfert. Kaufmann cites the example of NGC 4151 which has 28% of its light concentrated in its emission lines. The emission lines include spectra of iron with 9 and 13 electrons stripped away, so the process involves very hot gases. The Seyfert galaxies exhibit variability and some have luminosities approaching the fainter quasars. Approximately 10% of the brightest galaxies in the sky are Seyferts. They are divided into Type 1 and Type 2 Seyferts. Seyferts are thought to be spiral galaxies with a quasar-like center. B L Lacertae objects are active galaxies characterized by rapid (days) luminosity variations and a lack of emission lines in their spectra. When variability takes place in periods less than a day, variable objects are sometimes called blasars. B L Lacertae objects are thought to be elliptical galaxies with quasar-like centers. A class of active galactic nuclei which show optical variability with periods on the order of a day or less are commonly referred to as blasars. They are further classified as radio-selected (RBL) and xray-selected (XBL). They are associated with the rapidly varying B L Lacertae objects.